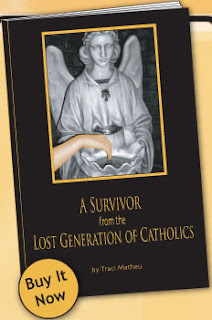 The most recent book in my huge nightstand bookstack for me to finish reading was, “A Survivor from the Lost Generation of Catholics” by Traci Matheu. My interest in reading this book came about when I heard Lisa Hendey interview the author on Catholic Moments in 2008. Since I’m from that same generation of “lost Catholics” the topic really piqued my interest. The author used this book as a personal journey of sorts. At times the chapters didn’t really seem to flow together, but individually, I enjoyed them. The author brought it all together finally in the last chapter. My interest in the book really perked up when I hit Chapter 4. Faith Without Knowledge Cannot Grow. This chapter is at the heart of what identifies us, the post Vatican II children, as the “Lost Generation of Catholics”. We grew up without focusing on details about the Catechism or the deep foundation of our faith; instead our education focused on how much God loves us and the spiritual nature of faith. In Chapter 5, How to Repair the Foundation of the Family, the author writes with a voice that could have been my own voice. She speaks about her own journey that greatly parallels much of my own. As a Mom, I have a responsibility to teach my children, but how was I going to convince my family to join the “band wagon” and become this wonderful Catholic family if I don’t know anything about my own faith? The more I learn about my faith, the more I understand all it has to offer? The author reassures me that while I do need my husband to be part of this faith quest to best raise our children in the faith, he doesn’t necessarily have to walk the same path I am on. My identification with the book continued through Chapter 5-8 as Traci Matheu addresses living the faith in our marriage and families. In Chapter 10, she relates her personal story of crisis that opened her eyes to her relationship with God in a new way. Her journey from that crisis is told with great humility and honesty and it forced me to reflect on my own relationship with God. The rest of the book is a good read, though it is not wholly unique to our Generation of Catholics. From my perspective, the book contains good, well written information about our faith, families, society and country. If you are a cradle catholic who was born in the 1960’s or 70’s, you will probably identify with the author’s stories and experiences growing up in the Church post Vatican II. The book’s strength lies in the middle chapters and makes the rest of the book worthwhile and an inspired read. PRAISE BE JESUS AND MOTHER MARY..